On Thursday January 21, at the Lewiston Senior Center, the Western New York Land Conservancy will unveil the Stella Niagara Preserve Vision Plan. 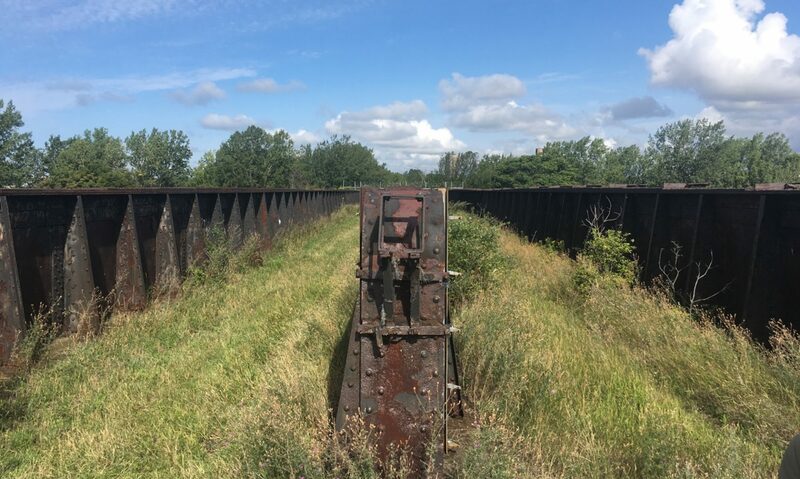 To create the Preserve, the Land Conservancy purchased the property — the largest privately held undeveloped tract of land along the Niagara River — in June 2015 after a $3 million capital campaign. It was opened to the public the following month and features spectacular views, walking trails, fishing access and a place to put a kayak in the water. The Stella Niagara Preserve will be a world-class, publicly accessible nature preserve that provides an iconic cultural and natural link in the Niagara River Greenway. 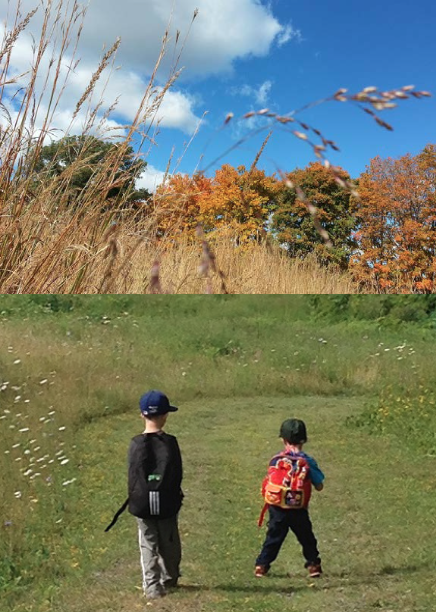 As the most high-profile acquisition and project to date by the Land Conservancy, the organization undertook a comprehensive planning process for the ecological restoration and on-going stewardship of the Preserve in keeping with the community’s vision and the organization’s priorities. 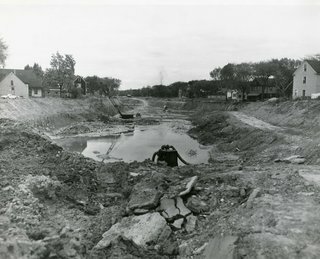 The group engaged nationally renowned landscape architect Darrel Morrison to create a restoration plan for the site, and also engaged Make Communities to work with stakeholders to establish principles and devise a vision for the Preserve to guide the site’s use, design and maintenance. The resulting Stella Niagara Preserve Vision Plan focuses on five pieces of Guiding Wisdom sourced from community conversations about the past, present and future potential of this incredible place. …is an incredible natural setting and provides a unique and crucial area for plant and animal life. …is a place for people to develop a relationship with nature. …has cultural, spiritual, and artistic importance. …has many important stories to tell and lessons to teach. This knowledge frames goals and strategies that are clear enough to chart a path forward, but flexible enough to be adaptable to changing conditions and circumstances. Provide access to the Preserve for people to walk, hike, kayak, canoe, learn, and be inspired. Protect and celebrate the Preserve’s diverse attractions. 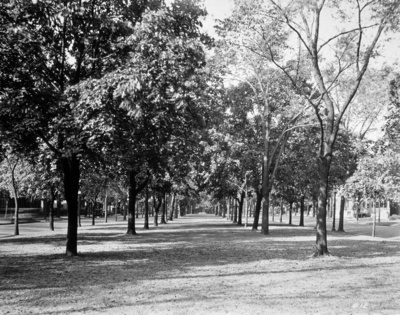 Explore and promote the Preserve’s history. Learn— and adapt—together over time. 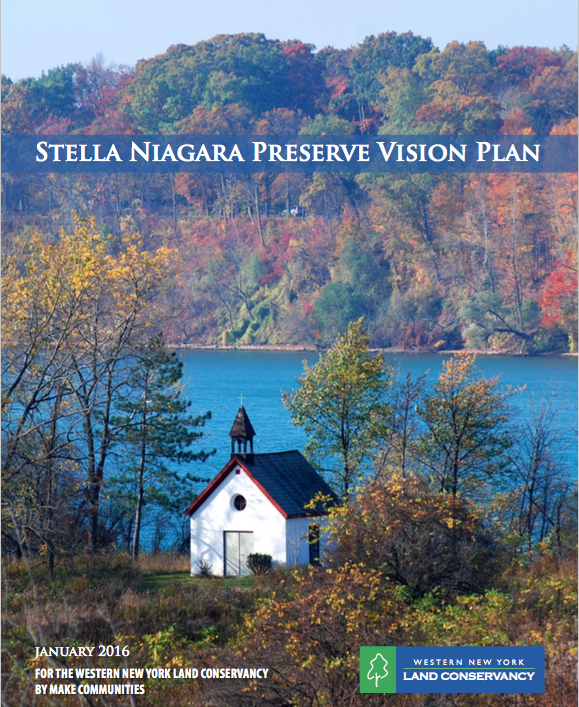 Read more about the Stella Niagara Preserve on the Western New York Land Conservancy’s website, or download the full Vision Plan here. …the housing sector is a prime example of the confluence of influences, often working together, to tilt the playing field away from communities of color. In Tuesday’s post, we alluded to the multiple institutions, agencies and individual actors that contributed to the development of racial and geographic segregation and discrimination in the Buffalo Niagara region. When it comes to the shape of our communities and the vast geographic disparities that exist, the housing sector is a prime example of the confluence of influences, often working together to tilt the playing field away from communities of color. In the 20th century and through the subprime lending crisis that still reverberates today, the federal government, private lending and real estate industries each played explicit and interconnecting roles in the decline of urban areas, particularly in communities of color. We can see the seeds of the de-urbanization and sanctioned housing segregation that was rampant throughout the middle 20th century planted in the tail end of the Great Depression. 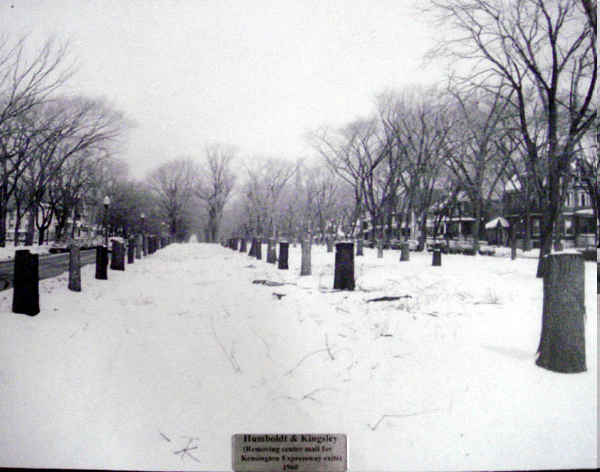 Redlining, the practice of denying one group of people equal service, terms or access, became an official federal housing policy beginning in 1937, and the trajectory that it established for communities throughout the city has continued to this day. Based on this policy, the federal government would not insure mortgages in areas they deemed prone to “adverse influences”, with those influences being defined almost entirely on the presence of residents of color. 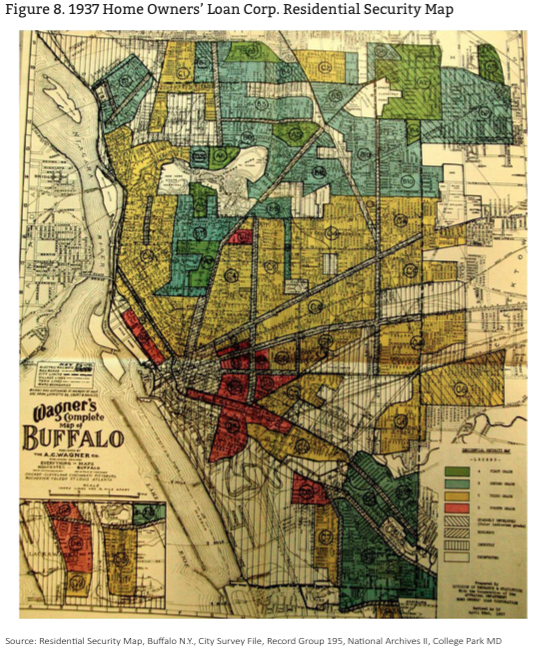 A City of Buffalo neighborhood conditions analysis shows 60 years after the institutionalization of redlining shows how government created maps became a self-fulfilling prophecy for communities of color. Far from acting alone, these government policies were extremely lucrative for many in the private sector, especially the finance, real estate and construction industries. Real estate and financial industry manipulation, restrictive race-based housing covenants, blockbusting, steering, speculation and unfair and exploitative lending practices all played a role and fostered a geographic imbalance and generational wealth gap that still exists today. The One Region Forward Equity Assessment goes into these practices in greater detail, but it also outlines a history of resistance of everyday citizens — such as the early efforts of the Masten District Community Relations Council, and the ongoing efforts of Housing Opportunities Made Equal — fighting for ethical business practices and equal treatment under the law. In the 120 years since the case of Plessy v. Ferguson — which established the doctrine of separate but equal — morality, experience and, eventually, the law have proven time and again that separate can never be equal. 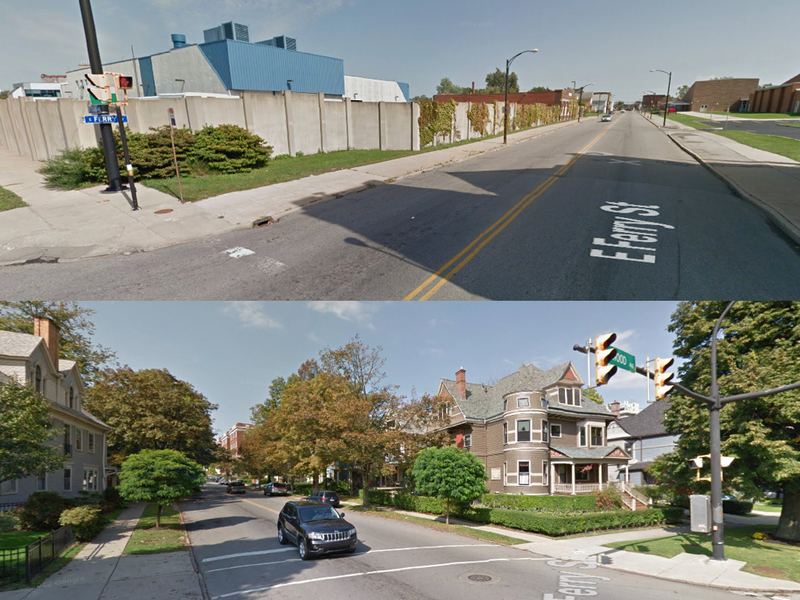 Yet in Buffalo Niagara we struggle, as do nearly all U.S. regions, with intense racial and ethnic segregation. From the opportunity gaps that we experience, and that our research verifies, it is clear that Buffalo Niagara is also intensely unequal. The stats can get complicated but simply reinforce what we have known to be true for too long. For instance, the Regional Index of Dissimilarity measures how one racial or ethnic group is distributed throughout the region as compared to another racial or demographic group. On a scale of 0-100, with 60 generally being considered a very high level of segregation, this measure conveys the percentage of one group that would need to move in order to achieve perfect integration with the other group. 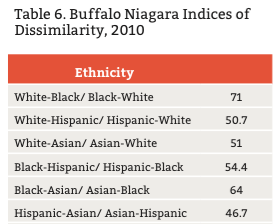 The divide between black and white is largest of any differential in Buffalo Niagara at a striking 71. The “Main Street divide” is real, and it is stark. 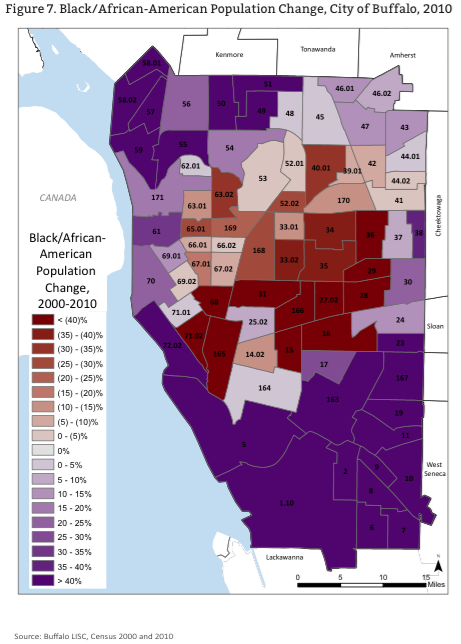 Nationally, the Buffalo Niagara Metropolitan Statistical Area (MSA) ranks high in segregation – as 6th most segregated on the White-Black index of the 102 largest metros, 21st in White- Hispanic segregation and as the most segregated on the White-Asian index. Far from just dictating what sign of a geographic line people live on, the divide also greatly affects the access to opportunities and to services that people have on a daily basis. This unequal access leads to employment and achievement statistics that are skewed against people of color. The poverty rate of the white population in the region, then, is only 9.6%, but for African-Americans it is 36.1%, for Hispanic/Latino populations it is 35.8%, Asian/Pacific Islander 25.6% and Native Americans 23.5%. “…populations [of color] in the region suffer from reduced opportunity and outcomes in academic and occupational achievement, suffer poorer personal health and reduced quality of life. The lack of economic vibrancy in poor neighborhoods reduces the municipal tax base making it more challenging for local governments to provide adequate levels of services, amenities and infrastructure throughout the region. The inability to access employment, or additional challenges faced in accessing employment, in economically isolated neighborhoods means direct costs to government in the form of increased public assistance. Concentrations of poverty and lack of mainstream economic opportunity have also led to higher areas of crime, reflecting an increased burden on the criminal justice system. However, disparities in law enforcement skewed against minority populations have also created huge familial and social strains within minority communities as a disproportionate number of families lose loved ones to incarceration. In short, there is a high universal cost of concentrated and racialized poverty. In fact, the The Equality of Opportunity Project has found that both whites and non-whites have lesser chances of escaping poverty and climbing the economic ladder in regions that are more highly segregated. There is a distinct advantage to the region in addressing these issues and, as mentioned in an earlier post, a host of individuals and organization are working on these issues, growing a large and inclusive movement to achieve racial equity in Buffalo Niagara, but the work is far from complete. In future posts, we’ll delve into both some of the root policy and practice causes of segregation and inequality in the region, as well as the recommendations coming out of the One Region Forward Equity Assessment. Since 1990, Buffalo Niagara has seen a marked increase in diversity, but, at a macro level, the region remains more homogenous than New York or the U.S. as a whole. At a micro level, the diversification is not uniform across municipalities or throughout Buffalo Niagara’s communities. Every municipality in the region now has a higher share of populations of color than in 1990. But delving into the details within communities, it is clear that there are concentrations of diversification, while many communities remain almost entirely white. 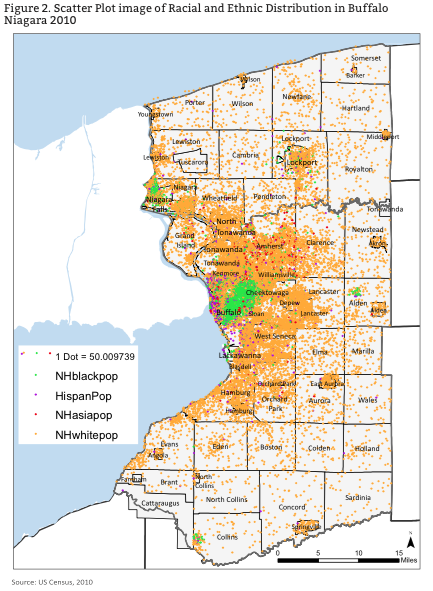 At a neighborhood level, the highest increases in populations of color are occurring throughout Buffalo’s west, north and far east sides and in central Niagara Falls. 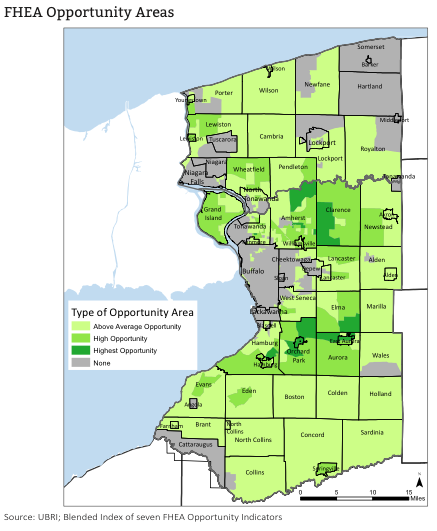 In the first ring suburban communities, are diversifying mainly nearest their borders to the city of Buffalo: western Cheektowaga, south and west Amherst and portions of the southern end of Tonawanda. The traditionally African-American neighborhoods on Buffalo’s near east side and the region’s Native American Nations represent the only communities in the region that have a smaller percentage of people of color than in 1990. 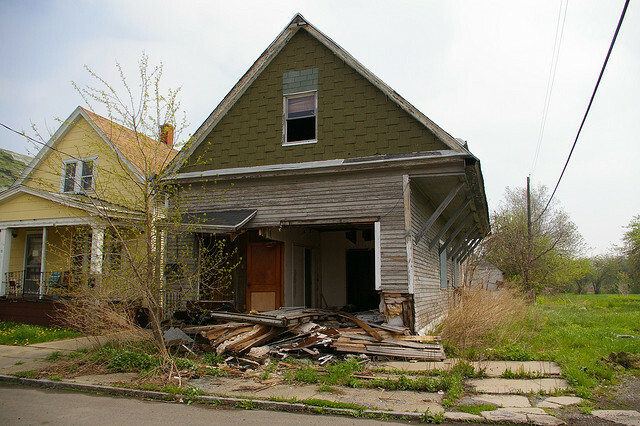 On the near east side this is largely driven by an outflow of African-American residents throughout the 2000s, but development pressures along Main Street and around the Buffalo Niagara Medical Campus are also fostering fears of displacement as property values and real estate speculation increase. 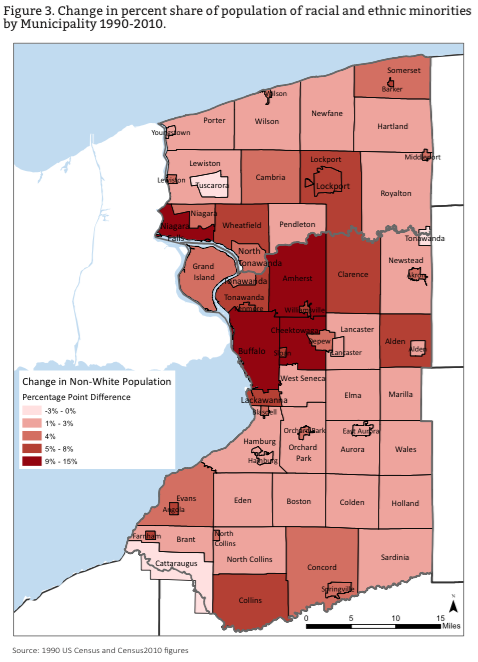 Though overall level of segregation throughout the region are trending downwards, segregation levels are still disproportionately high in Buffalo Niagara, and population of color are largely geographically concentrated: African-Americans in and near Buffalo’s east side and in Niagara Falls, Latino/ Hispanic populations along the Niagara River in Buffalo, and Asians on Buffalo’s west side and in southwestern Amherst. 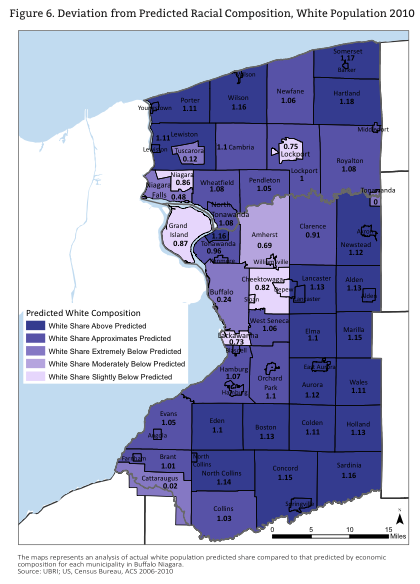 Though economic arguments are often cited as the reason some communities have low shares of populations of color, a test that controls for economic factors actually reveals that these arguments cannot account for the segregation that we observe and experience in Buffalo Niagara, with larger than expected shares of white population — and lower shared of persons of color — in the majority of Buffalo Niagara’s municipalities with very notable exceptions in and around the core cities of Buffalo and Niagara Falls. Tomorrow we’ll take a closer look at how this racial and ethnic segregation manifests itself throughout the region. Special thanks to Brian Conley from the UB Regional Institute who created these maps, all of which can be found in the One Region Forward Fair Housing Equity Assessment. Buffalo Niagara will be an equitable community when all people – regardless of how they look, who they know or who they love, what language they speak, what they believe, whatever their level of means or ability, when or where they were born, where they live, where they go to school or why or how long they’ve called this place home – have the opportunity, resources and tools needed to achieve their potential, to lead healthy and fulfilling lives with rewarding work, and to access, experience, and participate in all our region has to offer while ensuring others – now and in future generations – can do the same. Buffalo Niagara just completed its first regional plan in decades, and as the name implies the plan has pulled innumerable stakeholders together to create a singular vision: One Region Forward. Though the effort may be united, that should and does not imply a vision of homogeneity. In fact, amidst unprecedented demographic change, the plan takes an explicit and intentional look at the unequal conditions between racial and ethnic groups and how geographic inequity has reinforced disparities over decades. The somewhat clumsily titled (*cough* HUD requirement *cough*) Fair Housing Equity Assessment explores the past and present challenges to equity and opportunity and makes recommendations for future actions to create a united and inclusive region. To help guide and inform this project, Make Communities and the UB Regional Institute assembled an equity stakeholders committee, whose first task was to define a vision of an equitable community. The necessary legal structures and protections of equity have developed a complex and jargonistic language, one that is not only hard to understand on its face, but also has become weighted through decades of ideological battles on the right and left. Words like ‘protected classes’ may resonate with those steeped in the struggle to ensure civil rights are upheld on a daily basis. However, this is not the language that average Buffalonians — whether white or people of color — use to define or to talk about their own experiences. The equity stakeholders committee, with decades of experience in community, non-profit, government and business turned away from language that has the potential to divide. The collective vision of an equitable community aimed, instead, at the heart of the equity issue in terms that everyone can understand and relate to: all people should have the opportunity, resources and tools needed to achieve their potential, now and in future generations. With an straightforward, common sense approach to talking about those opportunities we want for our own families and our neighbors, the next step was then able to dive deeper into the the conditions on the ground to see if Buffalo Niagara is living up to this vision. Unfortunately, the research shows that there are large gaps in opportunity, influenced by how people look, where they were born and where they live. The team at One Region Forward is united, though, around the belief that this should not be the case, and future posts will unpack how we got to where we are and what we can collectively to do live into the vision of an equitable community. Yesterday’s post asked what the present holds for the residents who can’t wait for tomorrow. The question looms large in Buffalo. For all the promise in Buffalo’s revitalization, it is clear that we have much work to do to overcome the deep divisions within our region. 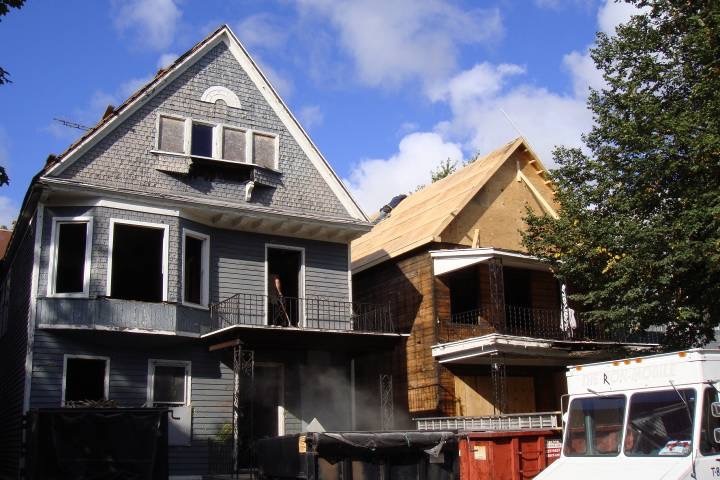 Make Communities recently partnered with the University at Buffalo Regional Institute to produce a comprehensive study on equity and opportunity in the region: the Fair Housing Equity Assessment. We identified tremendous gaps in opportunity, and found that these gaps are too often defined by race, ethnicity and geography. These discrepancies in opportunity are not random, or even unintentional. 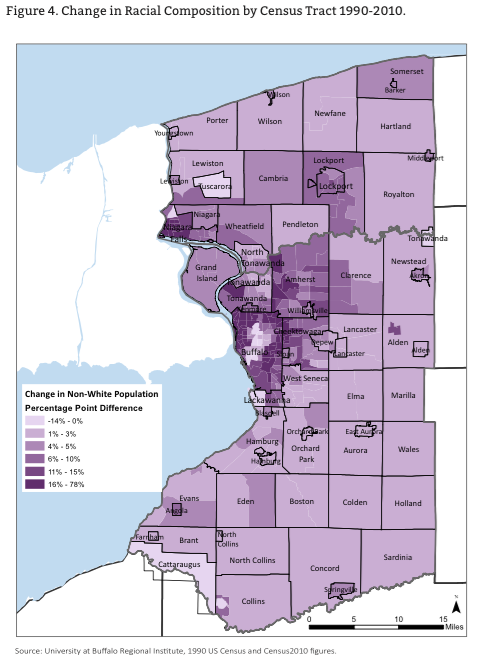 A host of systemic factors led to extreme geographic segregation and racial and ethnic disparities throughout the Buffalo Niagara Region in educational attainment, wealth and quality-of-life that we see today. These factors have included local, state and federal policy and investment decisions, discriminatory practices within the private sector and individual actions and biases. But in identifying these factors, we begin to understand how these practices and policies can be undone. In fact, some of these policies and practices have been discontinued, outlawed or overturned. However, there has not been a systemic response of the scale and scope necessary to overcome generations of ingrained inequality. To reverse these trends, the decision-making framework within the region needs to be more intentionally inclusive and reflective of the pervasive challenges of geographic, racial and ethnic disparities. That will only happen as the chorus of advocates, activists and everyday citizens grows larger and louder – a movement that is already underway, with new groups and initiatives like Open Buffalo, the Greater Buffalo Racial Equity Roundtable and the Buffalo Anti-Racism Coalition emerging to help support, unite and supplement the organizations and individuals who have been steeped in this work for years and decades. The analysis and insight in this report benefited immensely from the direct involvement of many of these champions for equity and opportunity that made up a stakeholder group helping to guide this analysis. 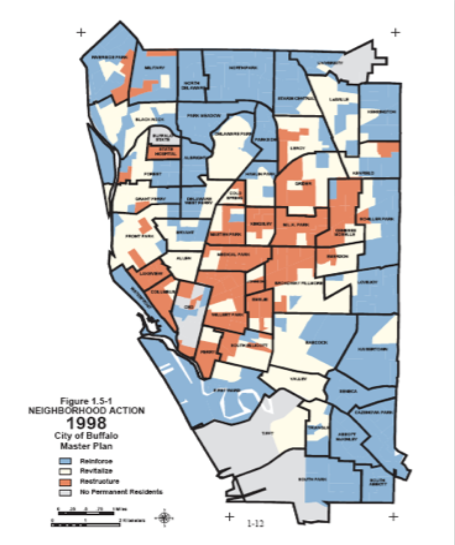 This blog will continue to highlight portions of the Fair Housing Equity Assessment, including barriers to opportunity and recommendations for charting a new path – a path that includes all of Buffalo’s residents in the promise of prosperity that, until now, too small a segment of the population has felt first hand. Sunday’s NYTimes features an article on the rise of metal scrapping in Detroit, and the measures that the city is taking to end — or at least limit — the practice. For those who scrap as a way of life, there is not necessarily a hard line between the two. 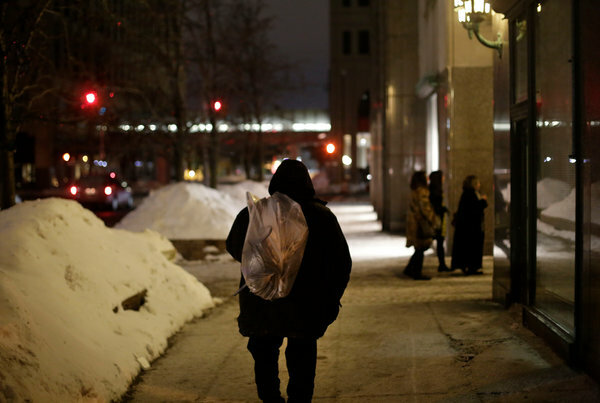 The Times follows Robert Jones Jr., “homeless and jobless for more than a decade”, as he tries to get by on trash picking and metal scrapping, among other odd jobs. His foil, Sgt. Rebecca L. McKay, oversees the Detroit Police Department’s response to scrapping, going after both those who strip buildings and the scrap yards that purchase illegal materials. Sgt. McKay plays the role of policing those who definitely aren’t living like kings in the “new” Detroit. Jones, explicitly says he doesn’t see opportunity for himself in the talk of the city’s revival, or in the urban farms run by white college kids popping up in his neighborhood. The article does a great job of opening up the incredibly trying dynamic of a city attempting to maintain its grip on a neighborhood where order has long since been lost. The undercurrent is the preservation of the past, and the assets that remain, with an a eye on a brighter future. The complication, though, is in the question of what the present holds for the residents who can’t wait for tomorrow. Detroit native Danny Brown delivers a powerful take on scrapping vacant buildings in his (NSFW) Scrap or Die.